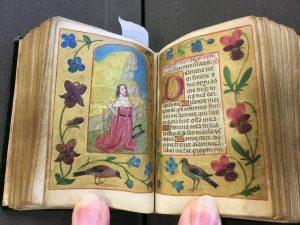 This is such a delightful book, and being so small, is one where it is not difficult to imagine that the manuscript would have been often carried around and was a favourite of its royal owner, Mary, Queen of Scots (1542–1587). 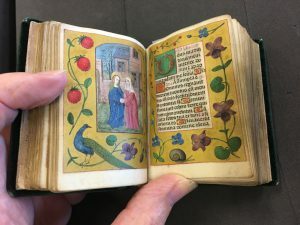 I had the privilege of studying this late fifteenth century manuscript which is in the John Rylands Library in Manchester. It really is a tiny book, see the picture below and how it fits into the palm of a hand. 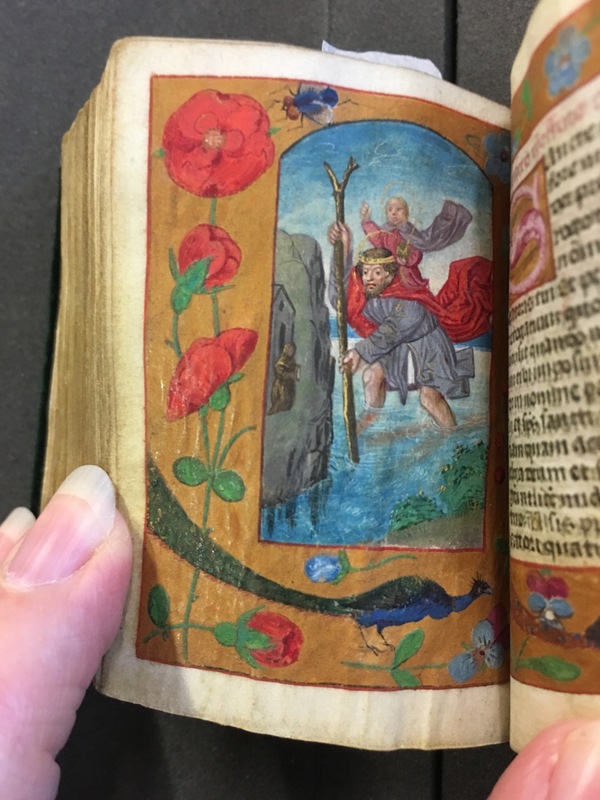 Here is a miniature of St Christopher carrying the Christ child on his shoulders across a turbulent river. The surrounding border is a complete contrast to the action painting, and shows red roses, insects and a peacock set on a shell gold background. The book is now covered in dark green velvet. 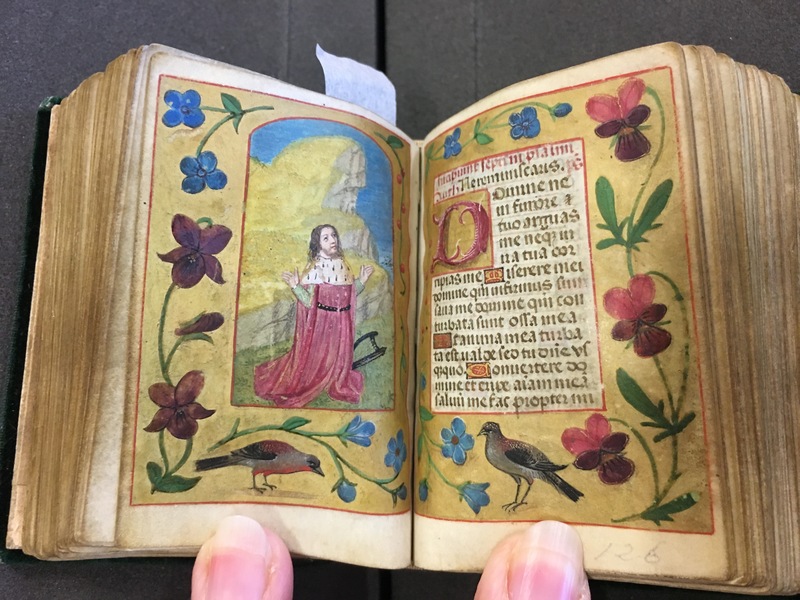 This picture gives an idea of the tiny size of the manuscript; the dimensions are 86 x 46 mm. 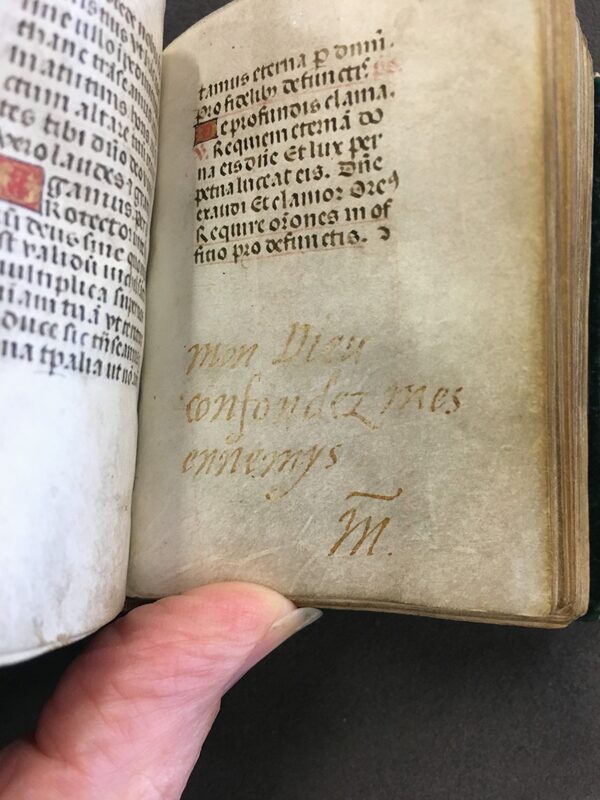 The text was written by a Flemish scribe in what calligraphers call Rotunda, a Gothic script. There are true Gothic elements such as the diamond serifs at the foot of the downstrokes, but the letters based on the letter o (eg b, d, p, q etc) are round rather than angular as in Gothic Black Letter/Textura. The script is competently done, but there is a slight movement in some of the downstrokes which could suggest either a tremor or skin that is not that well prepared. Having handled the manuscript I would suggest the former. 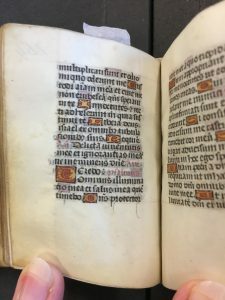 Initial letters are red and gold Versals encased within black rectangles. The rubrics are in pale pink rather than red. The fact that is was once owned by Mary, Queen of Scots, is reinforced by her writing on this page. The Queen writes in a firm Italic hand, and it is signed simply with an M with a horizontal line over the initial. There are certainly a lot of birds in the borders and often those birds are peacocks, as here. In mediæval times, the flesh of a peacock was thought not to decay after death, and the fact that the feathers are shed each year suggests renewal. And those feathers of the male look like eyes, which reflects an all-seeing God. Lastly, peacocks destroyed serpents, and a serpent represents the devil – so all of this indicated the links of peacocks to God and Christ. Here is shown the visitation of the Angel Gabriel to Mary. 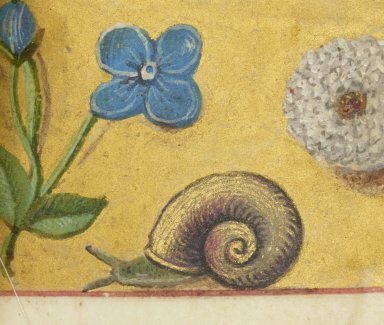 Note, too on the right-hand page, the snail, which surely all mediæval manuscripts should have! And here is another snail. This miniature shows King David with his ermine cape, red robe, and lyre by his side. There are no peacocks in the border this time, but chaffinches and beautiful violas as well. 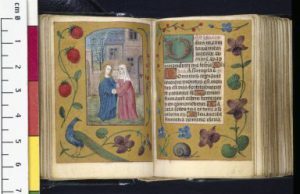 The gold background is slightly worn, which does suggest that the book was used. 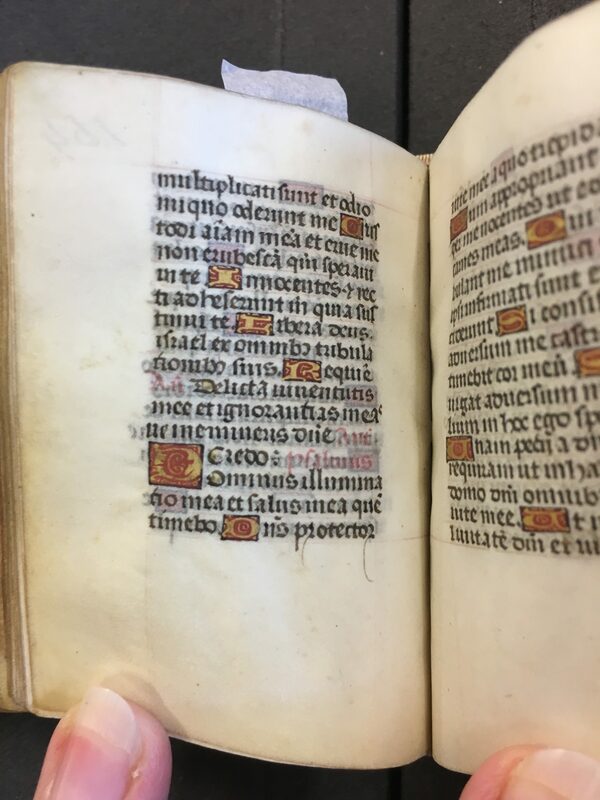 Actually handling the manuscript is a treat not offered to everyone and I am so grateful to the John Rylands Library for giving me the chance to look at and handle such an historically important and wonderful book. You can see more pages yourself here. This entry was posted in Blog, Books, Manuscripts and tagged Book of Hours, John Rylands Library, Mary Queen of Scots, Mary Queen of Scots Books of Hours, peacocks, Queen Mary, Rotunda script on 17 July 2017 by Patricia.